From the 1920s onward, military chiefs worldwide sought an aircraft that could directly support troops on the battlefield. But designers competing to create this asset were hampered by the weight of the ‘flying tank’, low air speed and flimsy protection. The Ilyushin Il-2 was the answer to these challenges. One of the key lessons of the First World War was that the airplane had a crucial role to play in effective military campaigns in the new era. With this in mind, in the 1920s and 1930s Europe’s leading nations expended significant efforts and resources on developing new aircraft that could be used to provide support for infantry and tanks. 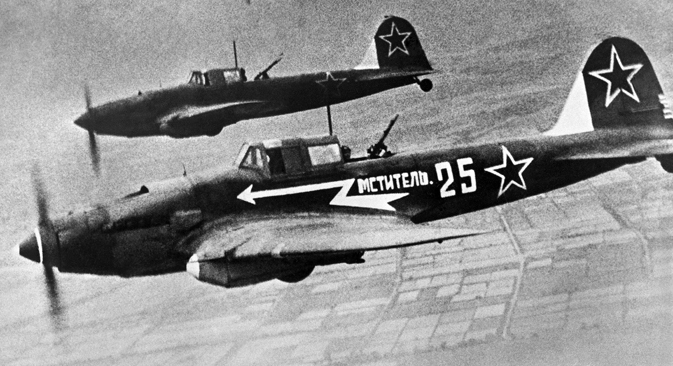 The Soviet Union began the creation of its Sturmovik (ground-attack) aircraft with an entire series of designs, armor-fitted and adapted for close strafing and bombing runs. In trials, however, these invariably proved too heavy and slow to be viable. Attempts by designer Nikolai Polikarpov to build the perfect assault aircraft also came undone on the battlefield. Laden with bombs and machine-guns but lacking armor, the R-5Sh Sturmovik showed low endurance in fighting during the Spanish Civil War, where they were used by the Spanish Republican Air Force, and in the Far East, where they served in the 1939 victory over the Japanese at the Battle of Khalkin Gol. As well as striking power, the military demanded a plane with sufficient protection for the pilot and mechanics against all types of weapons. The main obstacle was the manufacture of the armor plates, which were too heavy and resilient to easily work with. Merely putting a hole in a sheet of steel armor wore out two high performance drill bits. The problem was solved by Sergei Ilyushin, who dropped the idea of fitting sheets that only added weight and decided to structure the plane itself from steel armor. The resulting Ilyushin Il-2 was designed so that the engine, cooling system, fuel tanks and crew were all housed inside the fuselage. The aircraft’s eventual take-off weight, when loaded, was around five tons. Its maiden flight took place on October 2, 1939. Right up to the outbreak of war for the Soviet Union in 1941, work continued on ironing out the remaining flaws and preparing the aircraft for effective combat use. Although the Il-2 passed factory trials in 1940, the military still hesitated to introduce this future symbol of Soviet airpower until the last moment. Stalin himself decided the project’s fate after Ilyushin sent him a letter outlining the merits of his brainchild. The plane began to appear in the Soviet forces in the final pre-war months, and the outbreak of hostilities finally showed what the Sturmovik was capable of. From the early stages of the war, Il-2 pilots would carry out raids without fighter plane cover on armored columns moving by road during the German blitzkrieg. The pilots crucially believed in the resilience of their aircraft. In one well-documented incident during final deployment preparations, the young son of one pilot asked the commander whether his father would be killed at the front. The officer, Captain Konstantin Kholobayev, drew his service pistol and fired from close range at the metal casing around the Il-2’s cockpit. Apart from a chip in the paint, the round left no trace on the surface. The psychological effect of this action, as the captain noted later, was directed not so much at the child as the pilot. The Il-2 suffered high losses, however. The initial air superiority of the German Luftwaffe meant the heavy Soviet aircraft were easy prey. Furthermore, the Il-2 was new and pilots had to master it in combat conditions. At the start of the war, an Il-2 would on average survive around nine combat sorties. Overall, 26,600 of the aircraft were lost from 1941 to 1945, around half of them in combat. The high losses were partly because there was no rear gunner due to the prohibitive extra weight this would entail. Later modifications added a second crewman and weapon, after which enemy pilots became more wary about engaging the Il-2. But losses among the rear gunners were also heavy since they were not as well protected as the pilot. On the ground, meanwhile, the planes wrought havoc among enemy forces with their 400-kilo payload of bombs, Katyusha rockets and 23-mm cannons. Bearing much of the brunt of the onslaught, the German infantry varyingly nicknamed the Il-2 the ‘butcher’ or ‘mincer’, the Iron Gustav or the Black Death. German pilots were less complimentary, dubbing it the ‘concrete plane’ or ‘cement bomber’ because of its low maneuverability. Later in the war, as the Soviet Air Force gradually won air superiority, the Il-2 began to methodically suppress the ground forces of the Wehrmacht. It also demonstrated ruthless efficiency at sea: Soviet aviation units in the Arctic used the Il-2 to sink more than 100 enemy ships. The achievements of the Il-2, however, would not have been possible without the heroism of the crews. During the operation to take Koenigsberg, the capital of the German province of East Prussia, pilots of the Soviet assault regiment asked to have prisoners brought to them, in order to question them about the effects of their sorties. To their surprise, the German POWs immediately pleaded for their lives, having been told by their political officers that the Il-2 were crewed by maniacs who enjoyed tormenting prisoners between missions. Maniacs, they were told, because normal people cannot fly over a battlefield through anti-aircraft fire at an altitude of 100 meters.